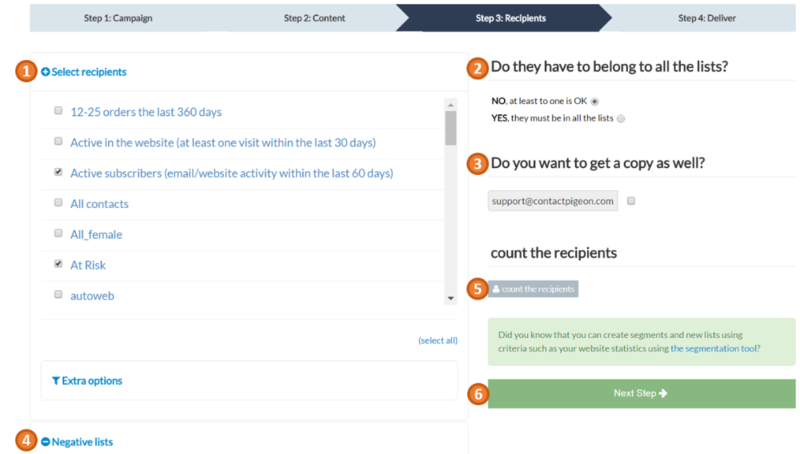 In this article, you'll learn how to create, test and send a campaign from scratch using our Drag & Drop Editor in ContactPigeon. If you have the above ready, let's dive in. Step 1. From the left side menu options, select Campaigns > New Campaign. Step 2. Enter the campaign subject line, sender name & email, and internal name for the campaign. Subject line - This is the first text your recipient will see, so make it appealing. To personalize your email subject with the recipient's first, last name or email, select the corresponding option from "Insert personalization" drop down. Sender name and email - How the sender name will appear to your recipients. The email address is the default one based on your account profile. To add additional sender email addresses, send a request to help@contactpigeon.com. Internal name - Descriptive name for the campaign for internal reference. Since this will not be visible to your recipients, you can use this field to indicate various version of the email (e.g., for A/B testing) or log any other information. Campaign folder - The campaign folder is used for grouping campaigns. By indicating a specific folder name here, this campaign will be automatically categorized there after you send it. If you don't indicate a Campaign folder, it will be added to a generic default folder. Google UTM - When this option is enabled, ContactPigeon will append descriptive UTM parameter to all links in your campaign. If you have Google Analytics configured for your website, you will then be able to track click-through activity from your campaign in Google Analytics. Step 3. Click "Yes, go to next step" to move to Content. In this section, you can select the template layout for your campaign. Alternatively, if you have an existing campaign in HTML format, you can directly import the code via the "HTML code" tab. The following step will cover how to create a campaign using our Drag & Drop Editor after selecting a base template. Step 4. Customize your campaign design by dragging and dropping elements into the template. Email body - This is a preview content of your email. Usable elements - Each box in this section represents an element which you can directly select and drag into the email body. These elements allow you to fully customize the campaign email such as text, images, products from your catalog, etc. Email design - Here you can style the overall look and feel of your email including - standard fonts, colors, line height. Preview - Preview how your email will look in tablet (pc) and mobile format. Save & Continue - Remember to save your campaign design before leaving this page. Step 5. Select recipients for your campaign by checking the corresponding contact lists. Select one or more contact lists as email recipients. 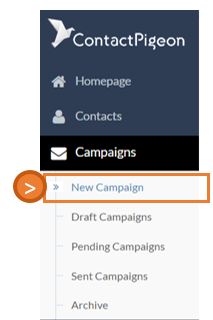 If multiple lists are selected, you can indicate whether if a contact need to be in all selected list in order to receive the campaign (YES) or the contact can be on either lists (NO). Check to receive a copy of the campaign when it's sent. Verify the total number of campaign recipients after all selection. Move to next step - Delivery. Step 6. Review your campaign one more time before delivery. Verify the subject, sender info, and recipients. To send a test email, enter your email under the "Single recipient's email" and click "Sent a test". You will receive the test email in a few minutes. Click on "Schedule Delivery" to move to the final step. Step 7. Set when you would like the campaign to be delivered. The default selection is "Send it now" for which the campaign will be sent immediately. To schedule your campaign for a future time, check "Schedule it for the following time" option. This enables a date and time fields for you to set exactly when the email will be delivered. Select the day, month, year, hour and minute. Finally, click "SEND" to confirm your campaign delivery. Hurrah, you're all set! Note: For campaign scheduled for future delivery, you will always have the option to cancel it before the scheduled time. See how to do so here.